Her new horror film, Us, is being called 'terrifying" and is set to hit theaters across the United States this Friday. And Lupita Nyong'o looked to be getting into the spirit of release week as she stepped out in New York City on Wednesday. The 36-year-old actress stunned in striking yellow contacts while enjoying a mild day in the Big Apple. 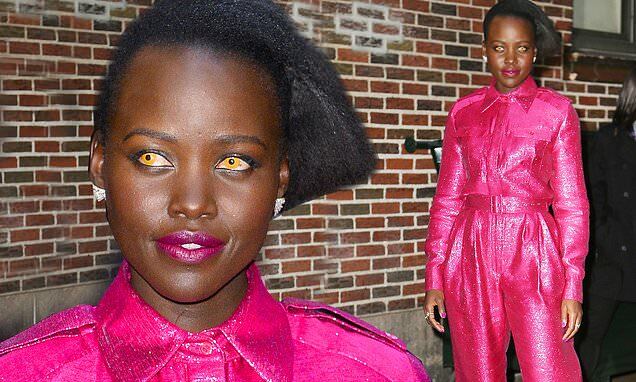 It wasn't only the Black Panther star's eyeballs grabbing attention as she sported a sparkling pink jumpsuit. She painted her lips an almost matching magenta and accessorized with intricate earrings. Lupita added a couple inches to her 5ft 5in frame via clear heels that featured silver spikes. Over the last several weeks, Lupita has been heavily promoting Us, the new horror film from Jordan Peele.